This general annotated bibliography page provides an overview of notable and not so notable works in the English language regarding the sport of fly fishing, listed by year of first publication. Although not all the listed books are devoted exclusively to fly fishing, all these titles contain significant fly fishing content. The focus of the present page is on classic general texts on fly fishing and its history, together with notable public or university library collections dedicated to fly fishing. For readability, the bibliography is contained in three separate lists. For books primarily dedicated to fly tying, fly tackle, regional guides, memoirs, stories and fly fishing fiction see: Bibliography of fly fishing (fly tying, stories, fiction). For species related fly fishing literature see: Bibliography of fly fishing (species related). Annotations may reflect descriptive comments from the book's dust jacket, third party reviews or personal, descriptive and qualitative comments by individuals who have read the book. Some older works have links to online versions in the Internet Archive or Google Books. The Purpose of the Fly Fishing Collection at Western Washington University Libraries Special Collections is to collect, preserve, and provide access to diverse materials supporting study of the sport of fly fishing. The collection includes books, periodicals, manuscripts, photographs, artworks, audio and video personal interviews and histories, and fly fishing artifacts such as rods, reels, flies, and fly tying materials. American works about fly fishing in America that are of fine quality in both physical presentation and content. The collection's current emphasis is on the spiritual, sociological, and aesthetic aspects of fly fishing. In addition to books, the collection includes magazines, paintings, prints, sculpture, and needlework. The Fords began transferring the collection to Western Libraries Special Collections in late 2003. It will be transferred in stages and will include newly published works of distinction selected by the Fords. ... the Daniel B. Fearing collection, one of the largest and most important (if also little known) pools of texts, manuscripts and journalson angling, fish culture, fisheries and whaling logs in the world. The Library of the University of British Columbia has an excellent collection of books on angling and fly-fishing, known as the Harry Hawthorn Collection. At present it totals more than 1800 books, including many rare and valuable items. This Collection came about as the result of a fishing holiday in 1953 by eight UBC professors and Roderick Haig-Brown at Upper Campbell Lake. The Milne Angling Collection includes a large number of volumes that represent the very beginnings of angling literature. Dame Juliana Berners' A Treatyse of Fysshynge wyth an Angle (1496) is considered the first book on the subject printed in England. Although some question her authorship, Berners, who was prioress of the Benedictine abbey of Sopwell, occupies a similar place in angling literature to that accorded Chaucer in English literature. The Milne Collection contains several editions of Berners' work dating from the 1827 William Pickering edition to modern versions, such as the one published in John McDonald's Quill Gordon (1972). Since our beginnings in the late Nineteenth Century, the MSU Libraries has striven to develop a world–class research collection in support of the academic goals of our university, including those of local interest with national and international resonance. Sixty years of research on fish and fisheries has given MSU a strong tradition on which to build the nation's preeminent trout and salmonid collection. Not only does the collection support this world–class research, but it is a focal point of local and regional pride for those who care about the salmonid species’ well being and about the waters that flow through this region. Housed in the MSU Libraries’ Merrill G. Burlingame Special Collections, this collection is open to the public for use on the premises in a controlled archival environment. Berners, Dame Juliana (1496). A Treatise of Fysshynge with An Angle (PDF). London: Wynkyn De Worde. Although it was once regarded as the source from which all later works on fly fishing sprang, the Treatyse can now, more correctly, be regarded as a British text on fly fishing which happens to have survived, although its status as the earliest English printed book on fishing means that it remains hugely influential. Dennys, John (1652). The Secrets of Angling. London: John Harrison. , The Secrets of Angling contains the first know illustration of an artificial fly. Denny's book was reprinted extensively in the 19th century. Walton, Izaak (1653). The Compleat Angler. London. , Izaak Walton did not profess to be an expert with the fly; the fly fishing in his first edition was contributed by Thomas Barker, a retired cook and humorist, who produced a treatise of his own in 1659. In the last edition a second part was added by his friend Charles Cotton, who took up Venator where Walton had left him and completed his instruction in fly fishing and the making of flies. Brookes, Richard M.D. (1766). The Art of Angling in Two Parts-Comprising all that is curious and valuable in the Art of Angling (PDF). London: T. Lowndes. , Online Version (7th Edition-1790), the Brookes text, which went through seven editions in the late 18th century, are extremely important in closing the gap of knowledge about fly fishing from the time of Walton to the early 19th century. Brookes is also the first to make written references to fly fishing in saltwater. Best, Thomas (1787). A Concise Treatise on the Art of Angling. London: B. Crosby & Co. , this work first appeared in 1787 and ran through 13 editions. He makes mention of the multiplying reel, the first time we hear of it, but evidently not unknown before his day. In the second part of the book, which has the special title The Complete Fly-fisher, he describes the dressing of many flies and their killing powers. Upon the whole, it is a practical and sensible work. Taylor, Samuel (1800). Angling in All Its Branches (PDF). London: T. M. Longman and O'Kees. , Angling in All Its Branches was one of the first works to address Fly fishing for Salmon and tying salmon flies. Taylor was the first fly fishing author to mention the use of a fly tying vice. Bainbrige, George Cole (1811). The Fly-fishers Guide (PDF). London: Longman, Orme, Brown, Green & Longman. , Bainbridge was one of the first authors to use color plates and The Fly Fisher's Guide contains numerous plates showing fly patterns, materials and tying techniques. The North Country Angler; or the Art of Angling as practiced in the Northern Counties of England (PDF). London: Longman, Hurst, Rees, Orme & Brown. 1817. Rennie, James (1833). Alphabet of Scientific Angling for use of Beginners (PDF). London: William Orr. , Dr.|Andrew Herd credits Rennie with being the first author to describe the complicated methods of producing fly hooks in the 19th century. Turton, John (1836). The Angler's Manual; or Fly-fisher's Oracle (PDF). London: R. Groombridge. Kirkbride, John (1837). The Northern Angler; or Fly-Fisher's Companion (PDF). Carlisle, Scotland: C. Turhham. Ronalds, Alfred (1839). The Fly Fisher's Entomology (PDF). London: Longman, Orme, Brown, Green and Longmans. , this 231 page, well illustrated treatment of British stream insects of importance to the trout and grayling angler laid the foundation for the detailed works on artificial fly imitation theory that followed for the next 100 years,. Wallwork, James (1847). The Modern Angler-Comprising Angling in all Its Branches. Manchester, England: James Cheltenham. Hutchinson, Horace. G. (1851). Fly-Fishing in Salt and Freshwater (PDF). London: John Van Voorst. Akerman, John Yonge (1852). Spring Tide; or the Angler and his Friends (PDF). London: Richard Bentley. Cartwright, William (Clericus) (1854). Rambles and Recollections of a Fly-fisher--Illustrated with an appendix contai'ning ample instrucitions to the novice inclusive of fly-making, and a list of really useful flies (PDF). London: Chapman and Hall. Herbert, Henry William (1859). Frank Forrester's Fish and Fishing of the United States and British Provinces of North America (PDF). New York: Geo. E. Woodward. , Frank Forrester, the pseudonym for English born Henry William Herbet was one of the most popular sporting writers before the Civil War. He popularized Hunting and Fishing with commercially successful sporting books such as this one,. Wade, Henry (1860). Rod Fishing in Clear Waters by Fly, Minnow and Worm-With and Short and Easy Method for the Art of Dressing Flies (PDF). London: Bell and Daldy. Norris, Thaddeus (1864). The American Angler's Book: Embracing The Natural History of Sporting Fish, and The Art Of Taking Them. With Instructions In Fly-Fishing, Fly-Making, And Rod-Making; and Directions For Fish-Breeding. (PDF). Philadelphia: E. H. Butler and Co.
— Paul Schullery, The American Fly Fisher, 1980. Otter (1864). The Modern Angler-Containing instructions on the Art of Fly-fishing, Spinning and Bottom-fishing (PDF). London: Alfred & Son. , Otter was a pseudonym for H. J. Alfred of London. Roosevelt, Robert Barnwell (1865). Superior Fishing; or The Striped Bass, Trout and Black Bass of the Northern States (PDF). New York: Carelton Publishers. Fitzgibbon, Edward (1865). A Handbook of Angling teaching Fly-fishing, trolling, bottom-fishing and Salmon-fishing (PDF). London: Longmans, Green & Co.
Burgess, J. T. (1867). Angling: A Practical Guide to Bottom-fishing, Trolling and Fly-fishing (PDF). London: Frederick Warne & Co.
Scott, Genio C. (1869). Fishing in American Waters (PDF). New York: Harper & Brothers, Publishers. Hallock, Charles (1873). The Fishing Tourist. New York: Harper & Brothers. Brown, John J. (1876). The American Angler's Guide (PDF). New York: D. Appleton & Company. Roosevelt, Robert Barnwell (1884). Superior Fishing; or The Striped Bass, Trout, Black Bass and Bluefish of the Northern States (PDF). New York: Orange Judd. Orvis, Charles F.; Cheney, A. Nelson (1885). Fishing With The Fly (PDF). Troy, NY: H. B. Nims & Co.
Halford, F. M. (1886). Floating Flies and How to Dress Them. A Treatise on the Most Modern Methods of Dressing Artificial Flies for Trout and Grayling with Full Illustrated Directions and Containing Ninety Hand-Coloured Engravings of the Most Killing Patterns Together with a Few Hints to Dry-Fly Fishermen. (PDF). London: Sampson, Low, Marston, Searle, and Rivington. , this was Halford's first book, and it launched the opening salvo in the decades long battle pitting fly fishers favoring the floating fly against those endorsing the sunk fly, an argument which today seems as appropriate as the house cook slipping on boxing gloves in preparation to picking out fly droppings from the black pepper. Nine color plates of hand colored flies. One color chart. Text illustrations. Six 19th century American fly patterns laid in. 136 pp. including index. Keene, J. Harrington (1887). Fly Fishing and Fly Making for Trout (PDF). New York: O. Judd & Co.
Taylor, J. Paul (1898). Fishing and Fishers (PDF). London: Ward, Lock and Company, Limited. Blakey, Robert (1856). Historical Sketches of the Angling Literature of All Nations - To which is added A Bibliography of English Writers on Angling (PDF). London: John Russell Smith. His history is suspect, at best. Westwood and Sachell, in their milestone Bibliotheca Piscatoria (1883), give the following opinions of Historical Sketches: "A slip-shod and negligent work, devoid of all real utility. A mere farrago of matter relevant and irrelevant, of indiscriminate sweepings from miscellaneous sources, of quotations incorrectly given and of so-called original passages the vaqueness and uncertainty of which rob them of all weight and value. Names and dates are seldom given, or are inaccurately...." They go on to catalog a few of the grosser errors and conclude that the book's only value is in its excellent bibliography, which, as we will see, also has its problems. — Paul Schullery, The American Fly Fisher, 1985. Smith, John Russell (1861). A Bibliographical Catalogue of English Writers on Angling and Ichthyology. London: Tucker & Company. Albee, Louise Rankin (1896). Justin Winsor, ed. The Bartlett Collection-A List of Books on Angling, Fishes and Fish Culture in Harvard University Library. Cambridge, MS: Harvard University Library. Westwood, T.; Satchell, T (1883). Bibliotheca Piscatoria-A Catalogue of Books on Angling, The Fisheries and Fish Culture with citations touching on angling and fishing from old English authors (PDF). Covent Garden, London: W. Satchell. Hills, John Waller (1921). A History of Fly Fishing for Trout (PDF). London: Phillp Allan & Co. , Dr. Andrew Herd credits Hill with the first attempt to codify the history of fly fishing, albeit Hill's work shows a distinctly British bias and disregard for other European influences. Radcliffe, William (1921). Fishing From the Earliest Times (PDF). London: John Murray. Goodspeed, Charles E. (1939). Angling in America-Its Early History and Literature. Boston: Houghton Mifflin Company. Robb, James (1945). Notable Angling Literature. London: Herbert Jenkins Limited. Starkman, Susan B.; Read, Stanley E. (1970). The Contemplative Man's Recreation: A Bibliography of Books on Angling and Game Fish in the Library of The University of British Columbia. Vancouver, British Columbia, Canada: The Library of the University of British Columbia. , contains a Chronological Appendix Indicating Landmarks in the Evolution of Angling Literature and Some Prefatory Matters Pertaining to the History of The Harry Hawthorn Foundation for the Inculcation and Propagation of the Principles and Ethics of Fly-Fishing. Contains illustrations. McDonald, John (1972). Quill Gordon. New York: Alfred A. Knopf. ISBN 0-394-46989-5. Gingrich, Arnold (1974). The Fishing In Print-A Guided Tour Through Five Centuries of Angling Literature. New York: Winchester Press. , Gingrich, the well known founding editor of Esquire magazine surveys the major pieces of classic and modern fly fishing literature up through the 1950s. It is an excellent read to get a better understanding of the evolution of the various styles of fly fishing—wet, nymphs, dry, etc. as originally written about by the likes of Halford, Skues, Gordon and Jennings along with many others. Arnold Gingrich, founding editor of Esquire magazine, is a tremendous part of the literary history of fly fishing. The Fishing In Print, The Joys of Trout, and The Well-Tempered Angler are indispensable titles to the well-read fly fisherman of today. — Glenn Law, A Concise History of Fly Fishing, 1995. Waterman, Charles F. (1981). A History of Angling. Tulsa, Oklahoma: Winchester Press. ISBN 0-87691-343-5. Sheets, K. A. (1993). American Fishing Books-A Guide to Values. Ann Arbor, MI: Anglers and Scholars. , an alphabetical, by author, list of over 2000 titles of American published fishing books with values for collectable copies estimated by the author. Schullery, Paul (1996). American Fly Fishing-A History. Norwalk, CT: The Easton Press. , sponsored by the American Museum of Fly Fishing, Manchester, CT, when Paul Schullery was the managing director, Fly Fishing-A History is probably the most contemporary and complete treatise on the evolution of fly fishing as it is known today,. Schwiebert, Ernest (1998). The Henryville Flyfishers-- A Chronicle of American Fly Fishing. Far Hills, NJ: Meadow Run Press. ISBN 1-886967-08-3. , a notable account by Ernest Schwiebert and one of the seminal books on American Fly Fishing clubs. Schullery, Paul (1999). Royal Coachman-The Lore and Legends of Fly-Fishing. New York: Simon and Schuster. ISBN 0-684-84246-7. , while giving due respect to the elders of Fly-Fishing history, Schullery celebrates some lesser-known fisherman and some seldom-appreciated waters, such as the limestone streams of Pennsylvania. He muses on the pursuit of the ever-more perfectly "natural" fly and contrasts that quest with the storied success of the Royal Coachman, perhaps the gaudiest fly ever invented. Herd, Andrew Dr (2001). The Fly. Ellesmere, Shropshire: Medlar Press. ISBN 1-899600-19-1. Nemes, Sylvester (2004). Two centuries of soft-hackled flies-A survey of literature complete with original patterns. Mechanicsburg, PA: Stackpole Books. ISBN 0-8117-0048-8. Schullery, Paul (2008). If Fish Could Scream--An Angler's Search For The Future of Fly Fishing. Mechanicburg, PA: Stackpole Books. ISBN 0-8117-0435-1. In seven essays sometimes controversial, sometimes reflective, all fascinating, Paul Schullery ruminates on the evolution of fly fishing and delves into the big issues affecting the world of fly fishing today and tomorrow. Dams’ effect on fishing, the supposed cruelty of catch-and-release, competition among fly fishers, spinning versus fly fishing, and how transportation has changed the sport are just a few of the topics he covers. Greenhalgh, Malcolm; Jason Smalley (2009). Fishing Flies: A World Encyclopedia of Every Type of Fly. London: Harper Collins Publishers. ISBN 978-0-00-728845-8. Black, William C. (2010). Gentlemen Preferred Dry Flies-The Dry Fly and The Nymph, Evolution and Conflict. Albuquerque, NM: University of New Mexico Press. ISBN 9780826347954. Whitelaw, Ian (2015). The History of Fly-Fishing in Fifty Flies. New York: Stewart, Tabori and Chang. ISBN 9781617691461. Day, Frank Parker (1927). The Autobiography of a Fisherman. Garden City, New York: Doubleday, Page and Company. , in 1927, celebrated Canadian author Frank Parker Day wrote his autobiographical reflections on fishing, family, and, more broadly, humanity's place in the natural world. The Autobiography of a Fisherman, a Canadian fly-fishing classic, is a wonderful recollection of one man's life, with characters struggling in a depressed economy, contending with the social pressures of local village life, and responding in one way or the other to the pull of the big city. Day details his early introduction to fishing, which becomes a lifelong passion, at once a 'gentle art' and a 'disease'. Benn, Ernest (1977). G. E. M. Skues-The Way of a Man with a Trout. London: Ernest Benn. ISBN 0-510-22506-3. Sampson, Jack (1995). Lee Wulff. Portland, Oregon: Frank Amato. ISBN 1571880194. Robson, Kenneth (1998). The Essential G. E. M. Skues. London: A & C Black. ISBN 155821691X. Hilyard, Graydon; Hilyard, Leslie (2000). Carrie G. Stevens, Maker of the Rangeley Favorite Trout and Salmon Flies. Mechanicsburg, PA: Stackpole Books. ISBN 0811703533. Hayter, Tony (2002). F.M. Halford and the Dry-Fly Revolution. London: Rober Hale. ISBN 0-7090-6773-9. , the first definitive biography of the father of dry fly fishing, Frederic M. Halford. Berryman, Jack W. (2006). Fly-Fishing Pioneers and Legends of the Northwest. Seattle, WA: Northwest Fly Fishing LLC. ISBN 978-0-9779454-0-5. Lawton, Terry (2010). Marryat-Prince of Fly Fishers. Ellesmere, Shropshire, UK: Medlar Press. ISBN 9781899600489. Herd, Andrew (2010). Angling Giants-Anglers Who Made History. Ellesmere, Shropshire, UK: Medlar Press. ISBN 9781899600601. Francis, Francis (1920). A Book on Angling Being A Complete Treatise on the Art of Angling in Every Branch (PDF). Philadelphia: J. B. Lippencott. , 1st US edition of this 1867 book. St John, Larry (1920). Practical Fly Fishing (PDF). New York: MacMillan Company. Gingrich, Arnold (1965). The Well Tempered Angler. New York: Alfred A. Knopf. , more on the fishing life than how to, but lots of good stuff about light tackle fly fishing from the founding editor of Esquire. Contains useful bibliographic references to other fly fishing literature. Slaymaker II, S. R. (1969). Simplified Fly Fishing. New York: Harper & Row Publishers. , a general treatise on the basics of freshwater, warmwater and saltwater fly fishing and tackle. Latham, Roger; Bashline, James; Chandler, Leon; DuBois, Donald; Elliot, Bob; Green, Larry; Harvey, George; McNally, Tom; Sosin, Mark; Waterman, Charles (1972). There's No Fishing Like Fly Rod Fishing-The Cortland Series. New York: Richard Rosen's Press Inc. ISBN 0-8239-0248-X. , a compendium of articles by top fly fishing experts on the various aspects of freshwater, warmwater and saltwater fly fishing and tackle. Sponsored by the Cortland Line Company. Hidy, V. S. Pete (1972). The Pleasures of Fly Fishing. New York: Winchester Press. ISBN 0-87691-039-8. , a beautiful compilation of vignettes on fly fishing accompanied by excellent photography of fly fishing experiences. Migel, Michael J., ed. (1977). The Masters on the Dry Fly. New York: J.B. Lippincott. ISBN 0397011881. Kreh, Lefty (1992). Fly Fishing For Trout-Volume 1-Special Techniques. Birmingham, Alabama: Odysseus Editions. Goddard, John (1993). Fly Fishing For Trout-Volume 2-Understanding Trout Behavior. Birmingham, Alabama: Odysseus Editions. Tullis, Larry (1993). Fly Fishing For Trout-Volume 3-Small Fly Techniques. Birmingham, Alabama: Odysseus Editions. Whitlock, Dave (1994). Fly Fishing For Trout-Volume 4-Imitating and Fishing Natural Fish Foods. Birmingham, Alabama: Odysseus Editions. Hughes, Dave (1995). Fly Fishing For Trout-Volume 5-Fishing The Four Seasons. Birmingham, Alabama: Odysseus Editions. Tullis, Larry (1995). Fly Fishing For Trout-Volume 6-Nymphing Strategies. Birmingham, Alabama: Odysseus Editions. Kreh, Lefty (1993). Professionals' Favorite Flies-Volume 1-Dry Flies, Emergers, Nymphs & Terrestrials. Birmingham, Alabama: Odysseus Editions. Kreh, Lefty (1994). Professionals' Favorite Flies-Volume 2-Streamers, Poppers, Crustaceans and Saltwater Patterns. Birmingham, Alabama: Odysseus Editions. Kreh, Lefty (1992). American Masters Fly Fishing Symposium-Part One-Skills. Birmingham, Alabama: Odysseus Editions. Kreh, Lefty (1992). American Masters Fly Fishing Symposium-Part Two-Tackle. Birmingham, Alabama: Odysseus Editions. Kreh, Lefty (1993). American Masters Fly Fishing Symposium-Part Three-The Travel, the Fish, the Life. Birmingham, Alabama: Odysseus Editions. Kreh, Lefty (1994). Fly Fishing Knots and Connections. Birmingham, Alabama: Odysseus Editions. Kreh, Lefty (1991). 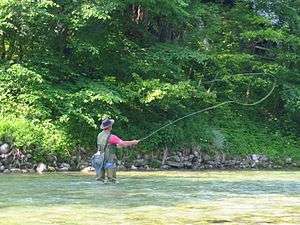 Modern Fly Casting Method-Mastering the Essential Casts. Birmingham, Alabama: Odysseus Editions. Kreh, Lefty (1994). Advanced Fly Casting. Birmingham, Alabama: Odysseus Editions. Richards, Bruce (1994). Modern Fly Lines. Birmingham, Alabama: Odysseus Editions. Kreh, Lefty (1991). Lefty's Little Tips-200 Innovative Ideas For Improving Your Fly Fishing. Birmingham, Alabama: Odysseus Editions. Kreh, Lefty (1991). Fly Fishing Techniques and Tactics. Birmingham, Alabama: Odysseus Editions. Kreh, Lefty; Middleton, Harry (1993). Lefty's Favorite Fly Fishing Waters-Volume One-United States. Birmingham, Alabama: Odysseus Editions. Bitton, Dennis (1995). A Field Guide To Fly Fishing. Birmingham, Alabama: Odysseus Editions. Kreh, Lefty (1992). Fly Fishing for Bonefish, Permit & Tarpon. Birmingham, Alabama: Odysseus Editions. Kreh, Lefty (1993). Fly Fishing for Bass-Smallmouth, Largemouth, Exotics. Birmingham, Alabama: Odysseus Editions. Kreh, Lefty (1995). Fly Fishing The Inshore Waters. Birmingham, Alabama: Odysseus Editions. Teeny, Jim (1994). The Teeny Technique For Steelhead & Salmon. Birmingham, Alabama: Odysseus Editions. Law, Glenn (1995). A Concise History of Fly Fishing. Birmingham, Alabama: Odysseus Editions. Kreh, Lefty (1996). Lefty's Favorite Fishing Stories & Complete Index. Birmingham, Alabama: Odysseus Editions. Merwin, John (2001). Streamer Fly Fishing - A Practical Guide to the Best Patterns and Methods of Fishing the Streamer in Rivers, Lakes and Salt Water. New York: Lyons Press. ISBN 1-58574-041-1. ↑ Rhead, Louis. A Collection of Bookplate Designs. Boston: W. Porter Truesdell. p. 23. ↑ Western Washington University Libraries Special Collections. "The Fly Fishing Collection". Retrieved 2 November 2011. ↑ Western Washington University Libraries Special Collections. "Paul and Mary Ann Ford Fly Fishing Collection". Retrieved 2 November 2011. ↑ Merritt, J. I. (Summer 1980). "The Kienbusch Collection". The American Fly Fisher. 7 (3): 3. ↑ Kinsey, Darin S. (Fall 2007). "An Angler's Literary Paradise" (PDF). The American Fly Fisher. Manchester, VT: The American Museum of Fly Fishing. 33 (4): 16–17. Archived from the original (PDF) on 2014-11-29. Retrieved 2014-11-16. ↑ Herd, Andrew Dr (2001). The Fly. Ellesmere, Shropshire: Medlar Press. p. 43. ISBN 1-899600-19-1. ↑ Leonard, J. Edson (1950). Flies-Their origin, natural history, tying, hooks, patterns and selections of dry and wet flies, nymphs, streamers, salmon flies for fresh and salt water in North America and the British Isles, including a Dictionary of 2200 Patterns. New York: A.S. Barnes and Company. p. 33. 1 2 3 4 Herd, Andrew Dr (2001). The Fly. Ellesmere, Shropshire: Medlar Press. ISBN 1-899600-19-1. ↑ Herd, Andrew Dr (2001). The Fly. Ellesmere, Shropshire: Medlar Press. p. 204. ISBN 1-899600-19-1. ↑ Robb, James (1945). Notable Angling Literature. London: Herbert Jenkins Limited. p. 94. ↑ Herd, Andrew Dr (2001). The Fly. Ellesmere, Shropshire: Medlar Press. p. 88. ISBN 1-899600-19-1. ↑ Schullery, Paul (1996). American Fly Fishing-A History. Norwalk, CT: The Easton Press. p. 85. ↑ Schullery, Paul (2006). Reading The Rise-Streamside Observations on Trout, Flies and Fly Fishing. Mechanicsburg, PA: Stackpole Books. p. 37. 1 2 Nemes, Sylvester (2004). Two centuries of soft-hackled flies-A survey of literature complete with original patterns (PDF). Mechanicsburg, PA: Stackpole Books. p. 1. ISBN 0-8117-0048-8. ↑ Schullery, Paul (1999). Royal Coachman-The Lore and Legends of Fly-Fishing. New York: Simon and Schuster. pp. 175–76. ISBN 0-684-84246-7. ↑ Schullery, Paul (Fall 1980). "Editor's Note to Fly Fishing Alone by Thaddeus Norris". The American Fly Fisher. 7 (4): 2. ↑ Westwood, T.; Satchell, T (1883). Bibliotheca Piscatoria-A Catalogue of Books on Angling, The Fisheries and Fish Culture with citations touching on angling and fishing from old English authors. Covent Garden, London: W. Satchell. p. 165. ↑ MacKenzie, N. A. M., I Went A-Fishing - A Most Informal Foreword in Starkman, Susan B.; Read, Stanley E. (1970). The Contemplative Man's Recreation: A Bibliography of Books on Angling and Game Fish in the Library of The University of British Columbia. Vancouver, British Columbia, Canada: The Library of the University of British Columbia. p. 7. ↑ Schullery, Paul (Summer 1985). "America's "Lost" Angling Books: Robert Blakey's Tantalizing References to Early American Fishing Books". The American Fly Fisher. 12 (3): 22–25. ↑ Law, Glenn (1995). A Concise History of Fly Fishing. Birmingham, Alabama: Odysseus Editions. p. 162. ↑ Lawton, Terry. "Fish and Fly Book Review". ↑ Gingrich, Arnold (1973). The Joys of Trout. New York: Crown Publishers, Inc. pp. 140–42. ISBN 0-517-50584-3. ↑ Serviente, Barry (1996). Angler's Art Catalog. Plainfield, PA: The Anglers Art. p. 91.